NJ Laser Dentistry’s newest location in Tinton Falls, NJ is the first dental clinic to feature countertops made from EOSCU, a material that self-sanitizes and continuously kills disease-causing bacteria*, raising the bar in infection control and patient safety. 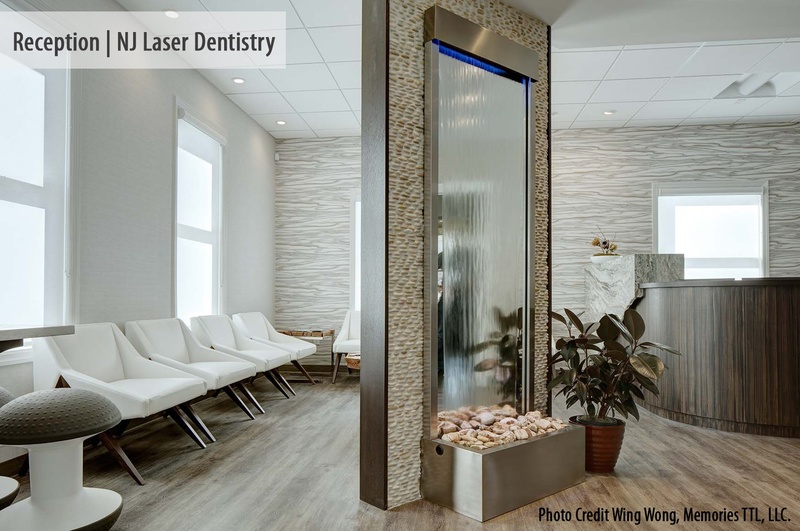 Tinton Falls, NJ, March 22, 2016 – NJ Laser Dentistry is excited to announce the opening of a stunning new office location in Tinton Falls, NJ, featuring cutting-edge design elements that are sure to please patients and staff, from an LED-lit dance floor in the waiting room to a coffee bar and flat screen TVs suspended on the ceiling beams above the dental chairs. One innovative feature may blend in to the background of this state-of-the-art facility, but works 24/7 to help keep clients safe from bacteria. 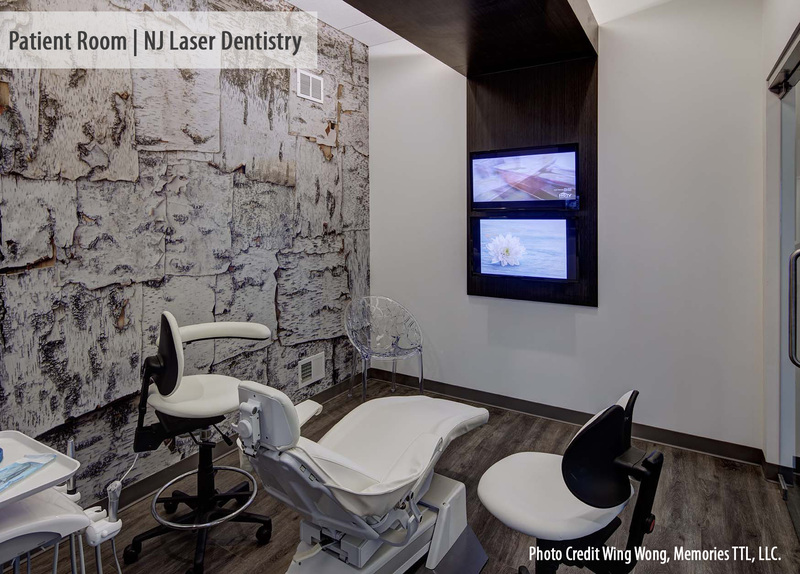 All of the flat workspace surfaces in the sterile lab at NJ Laser Dentistry are made from EOSCU, a hard surface material infused with a proprietary copper-based technology that actively and continuously kills harmful bacteria*. The Preventive|Biocidal Surfaces™ are EPA Registered for Public Health Claims and reduce the bacteria on the surface – continuously killing 99.9% within two hours of exposure. EOSCU reduces the risk of contamination of equipment, workers’ hands, dental devices, and other critical components that may otherwise be contaminated by the bacteria that are known to survive for extended periods of time on standard surfaces, especially between cleanings. So why copper-infused countertops in the lab? “With EOSCU among Fessenden Hall’s (distributor) latest product selection, we were able to offer a surface that was not only beautiful and natural, but one that is also an innovative technology for reducing bacterial contamination. NJ Laser Dentistry is raising the bar with their attention to patient safety,” says EOSCU sales representative, Rosemary Leister. In the sterile lab, EOSCU will work continuously to reduce bacterial contamination in a very important but little-seen space. Here, technicians produce and prepare dentures, implants, appliances, and other devices that will come into direct contact with patients and become a part of their oral health. Once these devices enter a patient’s mouth, the transfer of bacteria becomes an even greater concern without the kind of precautions taken by Dr. Bilow’s office. 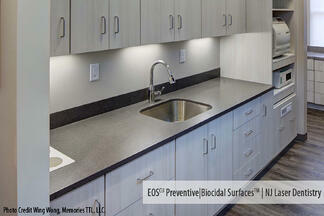 EOSCU, developed and manufactured by EOS Surfaces in Norfolk, VA, is the only synthetic hard surface EPA registered for Public Health Claims and proven to actively and continuously kill bacteria* in under 2 hours. The Preventive|Biocidal Surfaces™ have been installed in a number of hospital and other clinical settings, but NJ Laser Dentistry is the first dental clinic to include this unique material as part of its overall infection control protocols and efforts to reduce the risk of transmission. “From the functionality for the staff, to cut ting-edge bacteria protection, to the personal touches by the Bilow family - everything in this design has a story behind it,” says designer Beth Insabella Walsh, IIDA, ASID of INSABELLA DESIGN located in Little Silver, NJ. 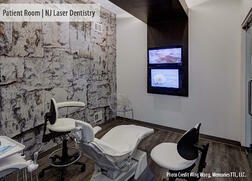 This space is designed to make patients feel comfortable, safe, and a part of the NJ Laser Dentistry community. There are even decorative rocks the Bilow family collected while snorkeling on vacation and brought home for the base of the water wall.” Walsh’s natural design elements also include natural bark wood vinyl wall mural, large windows for natural light, tree-stump coffee tables, and a water feature. *Testing demonstrates effective antibacterial activity against Staphylococus aureus (ATCC 6538), Enterobacter aerogenes (ATCC 13048), Methicillin resistant Staphylococcus aureus (MRSA-ATCC 33592), Escherichia coli 0157:H7 (ATCC 35150) and Pseudomonas aeruginosa (ATCC 15442). At NJ Laser Dentistry, Dr. Bruce Bilow and his Associates have proudly served the Little Silver community for 30 years. The practice recently relocated to a stunning, spa-like facility located in Tinton Falls, NJ. Patients relax as their care is managed utilizing the latest technology and techniques available in the healthcare industry today. Every member of our team is dedicated to providing extraordinary treatment experiences by focusing on the special comfort details that transform a visit to the dentist from tolerable to outstanding. We offer an exceptional variety of dental services, including implant care, cosmetic and reconstructive dentistry, orthodontics, as well as, unique, non-invasive periodontal therapies that allow for superior postoperative comfort and reduced healing times. We look forward to caring for you at NJ Laser Dentistry. For more information, visit http://www.njlaserdentistry.com/. INSABELLADESIGN, an award winning interior design firm based in Little Silver, New Jersey, provides interior design and space planning services to corporate, pharmaceutical, health care, education, government and residential clients. The firm's services include pre-design/ programming, schematic design, design development, contract documents, project management and construction administration. Since it's founding in 1993, INSABELLADESIGN has completed over three million square feet of distinctive, functional interiors. Principal Beth Insabella Walsh, IIDA, ASID, New Jersey Certified Interior Designer, along with the firm's team of designers, work in parallel with the client during all phases of the interior design process. These comprehensive professional services provide our clients with a single source of responsibility for a project's completion. For more information, visit http://www.insabelladesign.com/. Fessenden Hall Inc. is a 125-year-old family owned wholesale distributor of millwork component materials and specialty surfacing products. Fessenden Hall has a total of four locations with the corporate office in Pennsauken NJ. We service New Jersey, Central/Eastern Pennsylvania, Delaware and Eastern Shore Maryland. We handle Wilsonart laminates/metals, Meganite solid surface, Cambria quartz, EOScu Preventive|Biocidal Surfaces™ and more. The credo of the company has always been and always will be “Give the customers quality products that are competitively priced and above all give them the best and most dependable service that is humanly possible – and then some!” To find out more please visit www.fessendenhall.com.